Ordinance No. 09, Series of 2013 - Vigan Scholarship Program as Amended 2013. Ordinance 7, Series 2002 - Amending the Scholarship Program Ordinance. Ordinance No. 4, Series 1997 - Amending the Vigan Scholarship Fund Board of Vigan. Ordinance No. 5, Series 1996 - Amending the Scholarship Fund Board of Vigan. 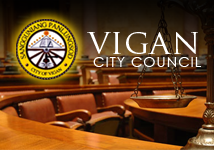 Vigan City Council is a Pro-active, Aggressive, Competitive, Empowered and Responsible Legislative body of the World Heritage City of Vigan.